Want to Save Money? Replace Your Furnace! Energy costs are spiraling out of control, and this trend is expected to continue throughout the next several years. If you’re like most homeowners, you’re probably looking for ways to reduce your utility bills despite the rising cost. While it may seem counterintuitive because of the initial upfront investment, replacing your old energy hog of a furnace may be the perfect way to reduce your expenses. Just in the past decade, the efficiency of residential heating systems has increased dramatically. Ten short years ago, the average furnace operated at 78% efficiency. (If you have an older heater, it may be operating at 60% efficiency or even less!) Today’s energy efficient heating systems, however, offer 98% efficiency. Efficiency is based on how well the system uses energy. If your system is 60% efficient, then only 60% of the energy you’re using is used to produce heat and 40% is wasted. With a modern system that’s 98% efficient, only 2% is wasted. Upgrading to a new furnace means you’ll see a drastic reduction in fuel cost as you’ll no longer be wasting nearly as much. 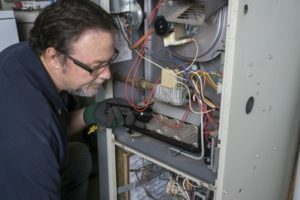 Just based on improved energy efficiency alone, upgrading to a newer furnace will save you big in the long run, but that’s not the only benefit. Over time, your old heater is likely to need more and more repairs. Replacing your furnace now means you’ll likely avoid the expense of those repairs, and those savings adds up quickly! Upgrading to a new furnace may also qualify you for valuable tax incentives and rebates. You could save up to $500 on your taxes just by getting a new furnace! If you’re thinking about upgrading your furnace, contact Larry & Sons today!